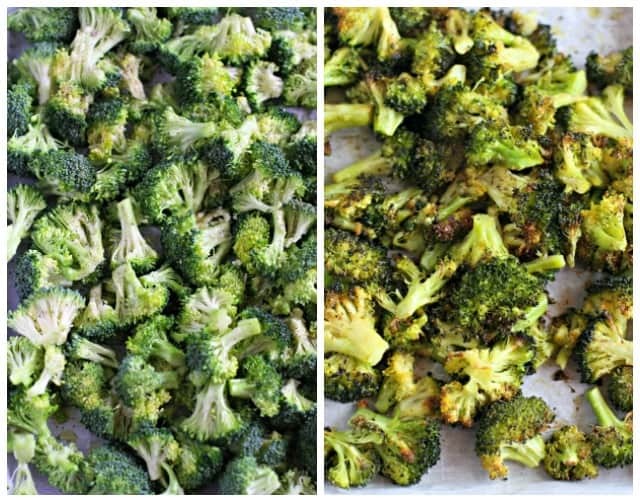 Home » Side Dish » Super Tasty Garlic Roasted Broccoli. Super Tasty Garlic Roasted Broccoli. 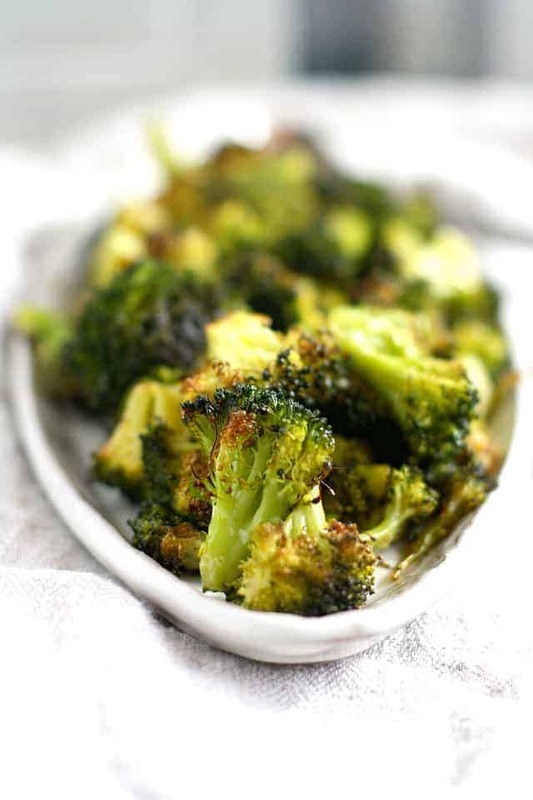 This recipe for the garlic roasted broccoli is simply the best! This is the perfect easy side dish for any meal. Kids and adults love this garlicky, crispy broccoli. What’s your favorite way to eat broccoli? 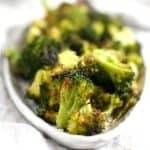 We love broccoli soup, and crunchy broccoli salad, but I think the easiest and tastiest way is to make this garlic roasted broccoli. Roasted broccoli takes very little prep time, and it’s nice and crispy and full of flavor. It’s a great side dish to serve with chicken, fish, or just about anything. This is the perfect way to get your kids to enjoy broccoli. It’s salty, crispy, and just all around delicious. What temperature is best for roasting broccoli? I like roast broccoli at 425 degrees for about 20 minutes. The edges of the broccoli florets should be brown and crispy. Can you roast frozen broccoli? Yes, you can roast frozen broccoli florets. It may take a few extra minutes for them to get brown and crisp, but it should still work! How long can you keep leftover garlic roasted broccoli? You can store leftovers in the refrigerator for three days. It’s best when it’s fresh, though! And if your family loves this as much as mine does, you won’t have any leftovers! How do you make garlic roasted broccoli? 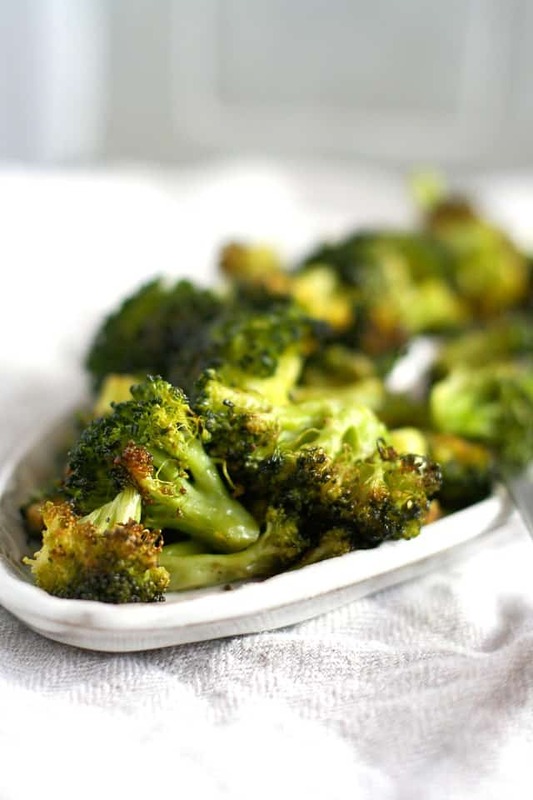 Toss broccoli florets with olive oil, salt, pepper, and minced garlic. Bake at 425 degrees for about 20 minutes, until brown and crisp on the edges. This is the best garlic roasted broccoli recipe. It's easy, flavorful, and kids and adults love it! Trim the florets off of the broccoli crowns. Place them on a cookie sheet. Bake at 425 degrees for about 20 minutes, stirring occasionally. The edges should get brown and crispy. You can store leftover roasted broccoli in the refrigerator for up to 3 days. You can use frozen broccoli florets if you wish, but the cooking time may be longer. This post was originally published in June 2011. It has been updated with new photos and more information. « Chocolate Gingerbread Donuts (Gluten Free, Vegan). That looks yummy! The nutritional facts ,is it per portion or the hole recope?The amount of proteins is very interesting! Per portion, and I don’t know why the protein came out that way. Nutritional facts are based on an app and are not necessarily exact! 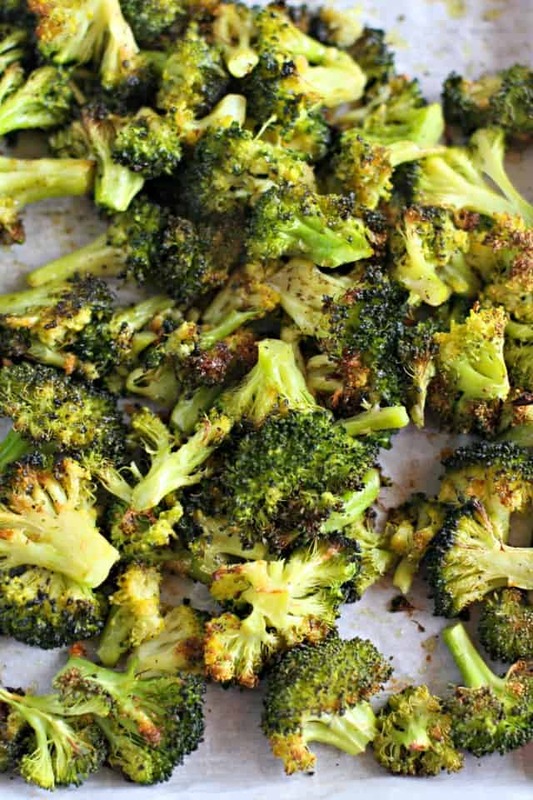 i’ve never roasted broccoli…but it sounds/looks delish! thanks for the idea. I do this with kale!! It’s sooo good!! Let’s see, I roast carrots, potatoes, asparagus, tonight I roasted sliced squash. I’ve learned that everything is better roasted with nothing but olive oil, s&p. I love roasted broccoli, cauliflower, and brussel sprouts. :) so good! I am a broccoli junkie, usually steamed. I’ll give this a try! yummy! I love roasted veggies! Looks good! We do asparagus all the time…I especially like it done on the grill…asparagus, grape tomatoes, olive oil and salt and pepper. Into the grill basket and onto the grill until the tomatoes are just about to burst…Yum! Asparagus! I make it the same way – sea salt, pepper, and olive oil. When it is done sometimes I toss with some lemon zest and crushed pistachios. I also roast brussels sprouts. I LOVE roasted Broccoli, and I usually throw carrots and onions in there too. The tips of the broccoli get so crispy and yummy and full of flavor. I ALWAYS add garlic too (to just about everything) and sometimes lemon pepper. I roast up a batch a couple of times a week so I always have some on hand!